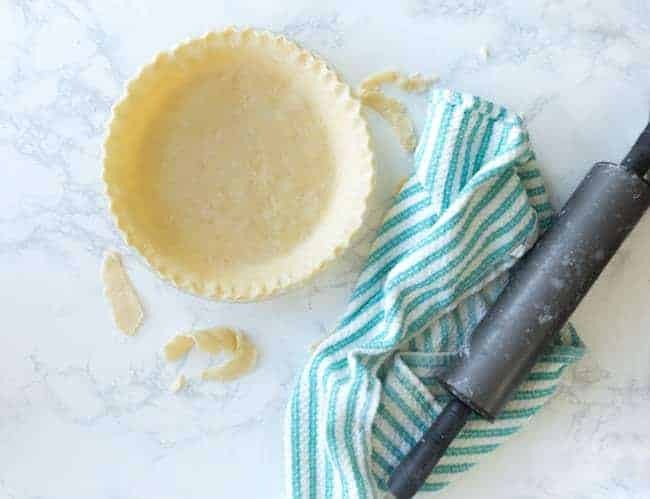 Vegan Pie Crust is totally achievable and not scary with these simple ingredients and easy-to-follow instructions. Be sure to bookmark this recipe in your browser so you can have it available whenever the craving for pie hits you. 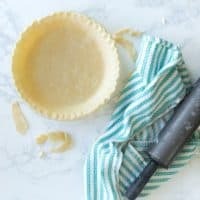 A vegan pie crust used to sound 110% impossible to me, and as a new vegan I was pretty sure I was doomed to a life without pie, pastries, and all the good things in life. I mean, when I think of pie crust, in the past, I would’ve thought of lard, cold butter, a splash of milk I’ve even seen in some recipes. None of things were going to be feasible for the new animal-free life we had chosen in our home. pie crust! it’s scary on it’s own with all the traditional ingredients. It would fall apart. It would get gummy. It would stick to everything. It would taste disgusting. So many reasons to just buy a store-bought pie crust, right? Sadly though, a store-bought version isn’t always as easily accessible in a vegan’s world. In my mind, I thought, there’s no way I’d be able to swap out vegan butter and vegetable shortening for the traditional ingredients and have it actually turn out good. I thought, pie crust just isn’t meant to be veganized. Or maybe I could make it and it would actually turn out, but it wouldn’t actually taste good in the end. Turns out all my thoughts were wrong! Yes, I just swapped in the vegan butter instead of regular butter. Yes, I used vegetable shortening instead of lard. Yes it was flaky and perfect! Yes I am going to make your vegan pie-baking adventures fail-proof. This holiday season, you can use this vegan pie crust for all your baking needs. The best part of all? No one will know it’s vegan… I promise! How do I make a perfect flaky crust anyway? I’m so glad you asked, because I totally get it. Pie crust can be scary and totally intimidating. I used to feel that way at least, and now it’s no big deal at all. These are the tips I’ve always used for the last 10 years I’ve been making homemade pies. 1st thing’s first. Keep everything cold! I always put all the ingredients and tools into the fridge about an hour before assembling the crust. This ensures that everything will be icy cold and ready to get to work! Work quickly with your hands so you don’t warm it up too much. I’ve also put ice cubes in my non-dairy milk just to ensure the chill factor in all my ingredients. Also, you can freeze the shortening an hour before you’re going to use it so it’s uber cold. Secondly, make sure you add vinegar! I know it’s a weird one. 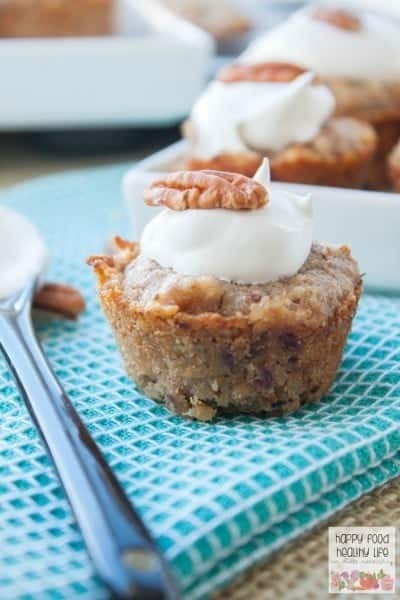 And you won’t find it in all pie crust recipes. You may have seen vodka added instead. They have the same purpose though. They prevent the formation of gluten, which would normally make for a tougher crust. You want flakey and tender. Which means you need to add just a titch of vinegar or vodka. You won’t taste it. I promise. Don’t forget the sugar! I’ve seen so many recipes that don’t include sugar at all. And I know it’s only a teeny tiny bit here, but it sure does make a difference between a bland a tasteless crust and one everyone will remember. Last but not least – practice makes perfect. I didn’t make my first pie crust without mistakes. I only started getting flawless pie crust after practicing a few times first… you know what that means though right? More pie for you!! Or if you don’t need a vegan version, this pie crust is spot on! With all these pie options, vegan or not, you are sure to have the yummiest holiday season ahead! 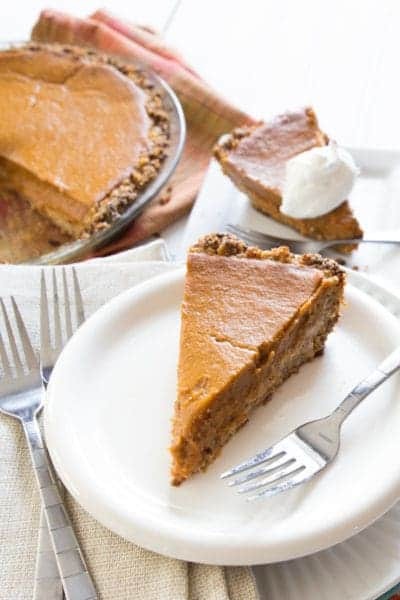 Just make sure this Vegan Pie Crust is part of the festivities! In a medium bowl, whisk flour, salt, and sugar together until well-combined. Add in the cold vegetable shortening and cut in with a fork or pastry cutter, incorporating the pieces of shortening into the dry mixture until it's crumbly and the shortening pieces are about the size of little peas or pebbles. Add in the vinegar. Then slowly add in the non-dairy milk (I prefer to use almond milk), about 1 Tablespoon at a time. After each add, use your hands to quickly incorporate the liquid into the flour mixture, creating a shaggy dough. You want to work as quickly as possible so you don't add too much warmth from your hands. Keeping all ingredients cold will keep the shortening in small "pebbles" allowing for a flaky and tender crust. Once the dough has come together, form it into a round disk. Sprinkle flour on a clean tea towel or dish cloth and place disk of dough on top. Sprinkle with a small amount of flour and roll gently with a rolling pin. Roll in all directions until your dough is about 1/8" thick and is slightly larger than your pie plate. 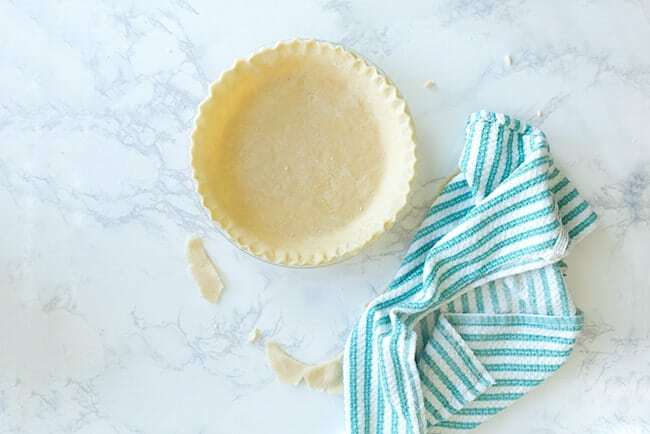 With the help of the tea towel, carefully pick up the pie crust and lay it into your pie plate. Trim the edges and if you'd like, make a pretty scalloped edge. 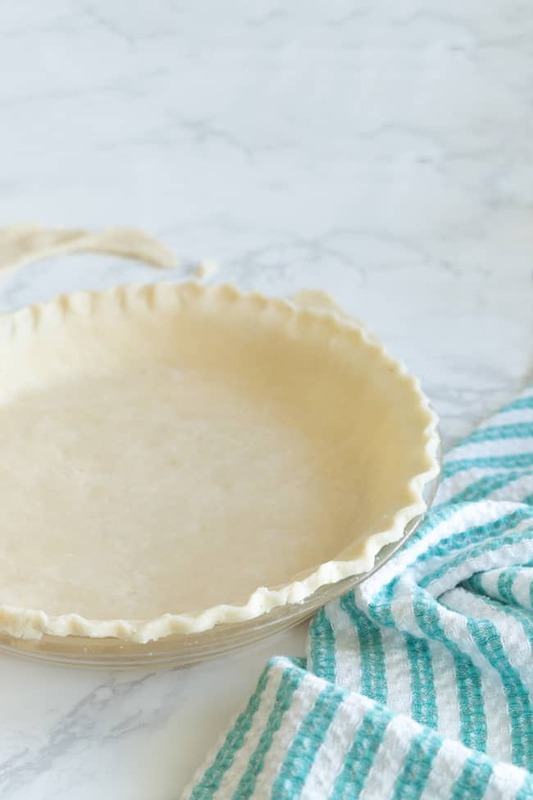 If your recipe calls for a pre-baked pie crust, bake for 17-20 minutes at 400 degrees F.
Otherwise, fill your pie crust as the recipe calls for and bake according to the instructions. 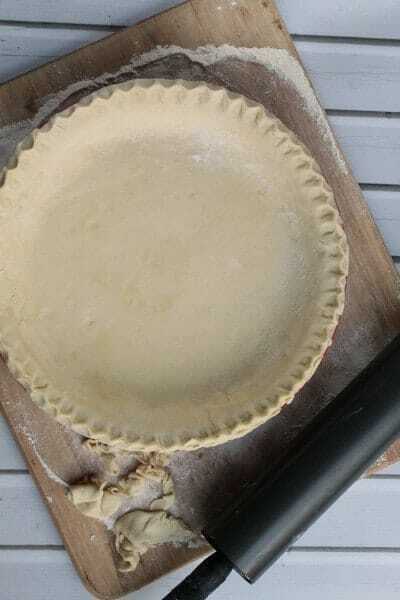 The biggest tip I have for working with pie crust is to keep everything cold! I always put all the ingredients and tools into the fridge about an hour before assembling the crust. This ensures that everything will be icy cold and ready to get to work! Work quickly with your hands so you don't warm it up too much.